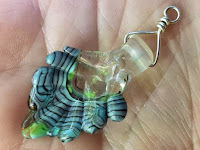 Over the years (many) I have made a LOT of lampwork glass leaves. 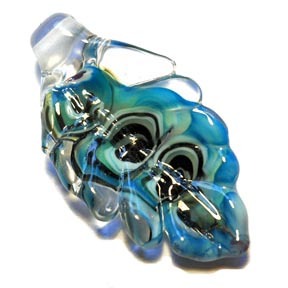 They are pretty quick and can be a good way to try out new colors and combinations. When someone buys something online, they are likely to get a lagniappe 'lucky' leaf included (unless I've temporarily run out). When I went to a family reunion, I made a bunch- leaves off the family tree- to give away. When I left, I forgot the leftovers in the rental car (my silly family was reticent to take more than one each). The company was kind enough to let me know and I told them to just keep them and distribute them. They probably pitched them. Lately I've been wondering- what happens to all those leaves? Do they get used? Worn? Given away? Put away in a dusty drawer somewhere for 'future use'? Tossed in the trash (hopefully not)? I decided it was time I tossed out some ideas of what to do with those wee leaves, so I am officially starting the 'glass leaf project' in hopes that these leaves will slowly make their way out into the world. The first leaf that officially became a part of this project was given to a well known lampworker~ he wanted to return it, but I insisted that, if he didn't want to keep the leaf, he could begin this project. So the first project leaf (in picture at right) may be somewhere out there already. * Make something out of it- OK, that's why it's sitting in a drawer, right? Too hard! * Give it to someone else to wear- someone who you love, someone who needs a bit of cheering up, a stranger on the street, whoever you like. No strings attached (well, you might want to put it on a cord for them). * Put it somewhere and let someone randomly find it. Maybe with a little note that says 'take me'. * Toss it in the drink. That's right, toss it in the nearest body of water for archaeologists of the future to find. 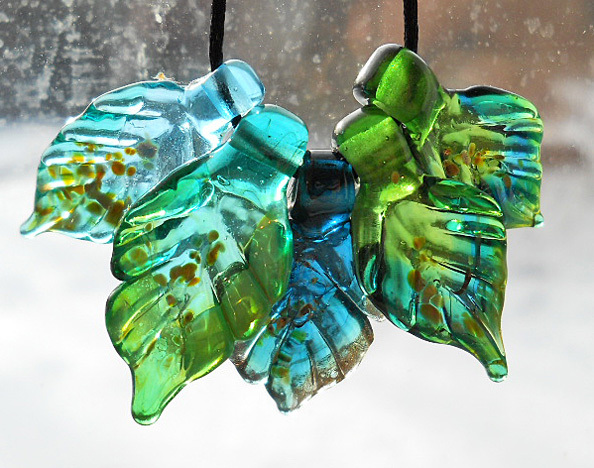 A bajillion years from now, these wee leaves could be found all over the world~ that's a fun thought. I have tossed a lot of seconds and failed beads into bodies of water along my travels~ ponds, lakes, rivers, streams, the Gulf of Mexico~ so this part of the project is already in motion. I do hope some of you will not only participate, but also let me know where your leaf ended up~ with a picture if you like! I don't know how to do this kind of stuff, so I will direct you to a post on my facebook fan page where you can comment and share pics if desired. Or you can post pics on my personal page!